Check the gown’s label for care instructions. Some must be dry cleaned while others can be “wet-cleaned,” which means cleaned with water, a process that can be handled by a professional. Often polyester dresses can be hand washed but test a small, hidden area to be sure. Labels may provide special instructions that specify the type of cleaning solvent that the dress requires. Check with your bridal shop for an experienced dry cleaner that carries the type of supplies and equipment your dress needs. If you choose to have the gown boxed by a company that specializes in preserving wedding gowns, they will likely use an acid-free wedding box, preferably not simply one with an acid-free coating as it will not provide as much protection in the long run. They should pad the bodice and folds with acid-free tissue. Fabrics like rayon or polyester should use buffered tissue while natural material like silk should use unbuffered tissue. If you have the gown boxed, do not get it sealed. 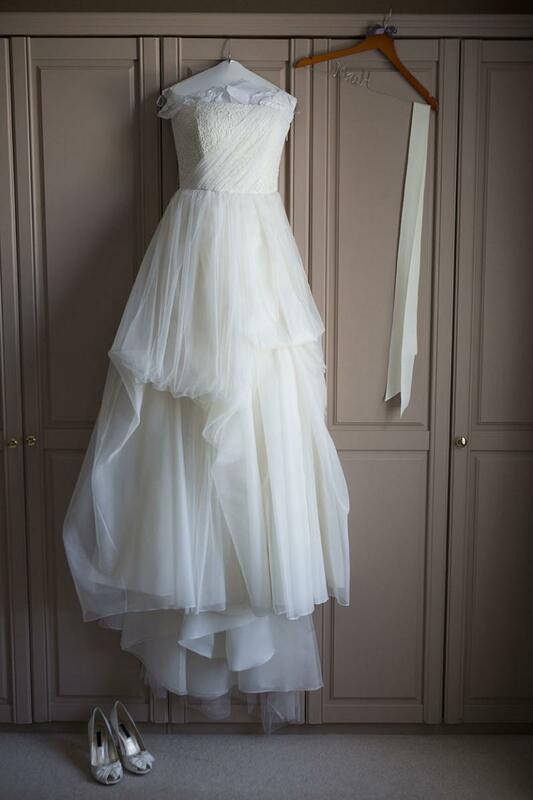 A dress that has been folded will need to be taken out and rearranged every year or so to prevent folds from creasing and permanently damaging the dress. An added benefit of storing your dress in an unsealed container is that you may take it out, try it on and enjoy it occasionally.